I had bought some wonton wrappers thinking I would make some perogies. I looked up a few recipes and realized there was a lot of cheese in them and I didn't want to make something so fatty. 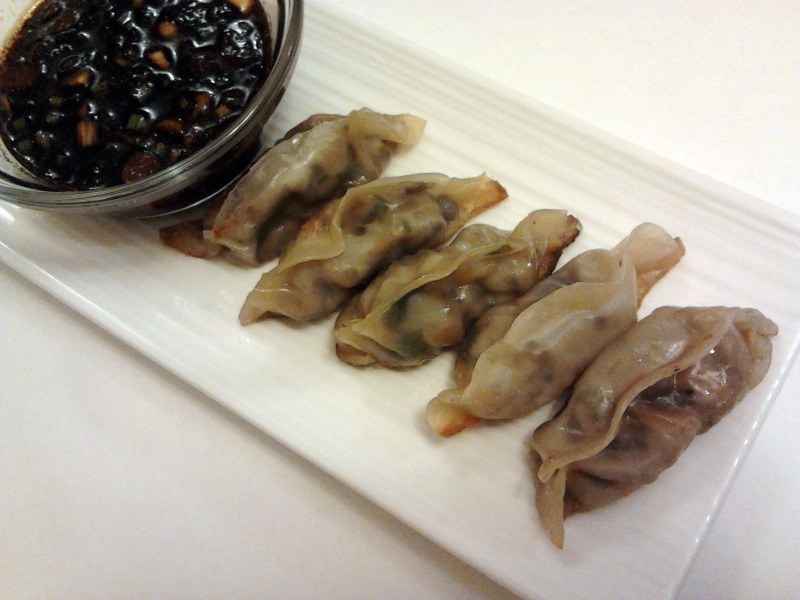 I decide I would give Pot Stickers a try. They were pretty easy to make...just takes some time to make them all. I wasn't able to get the pretty folding on the top that you usually see on pot stickers. In a wok, heat a little bit of oil. Saute onions, garlic and ginger until soft, Add mushrooms and coleslaw mix. Stir and season with salt and pepper. Cook until everything is soft. The original recipe says to drain in a colander. I did this but found that there was nothing to drain. Once mixture is cooled, mix in sesame oil and cilantro. It is now time to make the dumplings. In a small bowl put some water. Make half moon dumplings, filling with the coleslaw mixture. Lay a dumpling skin and add mixture. Dip your finger in the water and run around the edge of the dumpling. Fold over and seal. Make sure the bottom of the dumpling is flat. Heat a non-stick skillet over medium-high heat. Put a thin layer of oil at the bottom. Add all the dumplings. Once the bottom has browned add 1/4 cup water and cover immediately. This process is steaming the dumplings. Once the water is evaporated check if the dumplings need more steaming. I needed to add another 1/4 cup of water. The water must completely evaporate so the bottom can crisp up again. Woah.. this looks so good! I can imagine myself dipping the pot stickers into that amazing soy sauce mixture and relishing every bite!